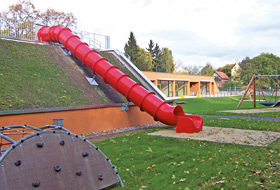 The roof slide in the “Rasselbande” kindergarten in Erfurt/Germany is an added play option for the children. Model: the school complex in Neckargmünd/Germany combines 4000 m² of green roof with photovoltaics and exploits the synergy effects. 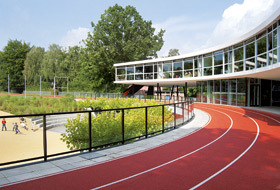 The extension building at the Gorch-Fock school merges into the topography of the school complex to allow the Tartan running track to continue over the roof. As there are classrooms beneath the running track it was important to address the issue of impact absorption. The highly-durable Elastodrain® EL 202 drainage and building protection plates provide a foundation for the Tartan running track and walkways. The building, renovation, extension or refurbishment of crèches/ kindergartens or schools present a considerable challenge to client, architects and contractors on a number of different levels. Driven by requirements of economy, sustainability and the energy balance of a building, in addition to complying with planning and building legislation associated specifically with such buildings, there is immense scope for design. The roof of the building alone allows for a considerable variety of designs thanks to the range of different shapes and uses. With ZinCo green roof systems, there is no limit to creativity. As a rule, kindergarten and school roofs are flat or have only a slight pitch. Depending on the building, they are on average between 200 and 2,000 m² in size and are often divided into individual roof areas. In the case of new buildings and refurbishment, the focus is generally on the longevity of the building. This in itself requires a green roof as it will protect the waterproofing from the effects of weather and temperature fluctuation and will contribute to considerably extending the lifetime of the roof. The question is whether the choice will be for an easy-to-maintain, self-regenerating extensive green roof or a roof garden that can also be used for example for “urban farming”. From a green roof point of view, virtually anything is possible, provided the building is structurally equipped to carry the required load. Even a roof-top school garden with tomatoes, berry bushes and apple trees can produce a successful harvest. Maintaining an intensive green roof is similar to maintaining a garden at ground level, including the appropriate irrigation. It goes without saying that poisonous plants should never be used in an environment where children will be present. Seating areas, pathways and play areas can always be installed on roofs. For example, in the “Rasselbande” kindergarten in Erfurt/Germany, a tube slide goes directly from the roof down to the ground. Depending on the building and the design requirements, ZinCo can provide various system build-ups for professional greening, including suitable railing solutions that can be installed without roof penetration – a definite advantage from a construction point of view. In addition to the classic extensive and intensive green roofs there is another use for a flat roof: combining a green roof with solar energy. In this case, the synergy effect begins with the equipment which includes base plates that are suitable for use on a green roof. The base plates secure the solar mountings in line with the principle of the superimposed load, without penetrating the roof waterproof membrane. During operation, the extensive green roof provides for a comparatively low ambient temperature and with that for an improved level of efficiency of approx. 4 % of the photovoltaic modules. 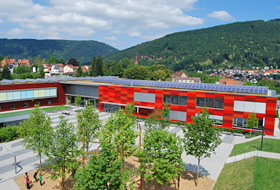 Due to their large surface area, school roofs are excellent for this application, one example being the school in Neckargmünd/Germany that has photovoltaic modules across a roof area of an impressive 4000 m². 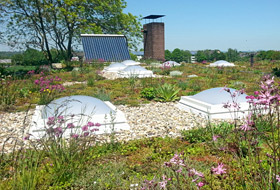 The 400 m² roof of the “Humboldtpinguine” kindergarten in Essen-Haarzopf, which was refurbished in 2012, is a classic example of a beautiful, extensive green roof with a variety of different plant species. The planning, execution and maintenance of the new roof was carried out by the experienced roof contractors, Grün+Dach Garten- und Landschaftsbau. First of all, the protection mat SSM 45 was installed over the root-resistant, bituminous waterproofing. Given that the roof has a pitch of only 2 %, puddles are likely to form. Damage to the plant roots caused by this standing water is prevented by the use of the appropriate system build-up with Floraset® FS 50, as the 50 mm deep drainage elements will ensure the necessary elevation over the water. While the green roof build-up will be higher than the standard build-up with its 25 mm deep Floradrain® FD 25 drainage elements, it won’t be heavier, as the Floraset® polystyrene elements are very light. The system filter SF is installed over the drainage layer and is followed by an 80 mm deep layer of “Rockery type” substrate, specially mixed to produce the desired greenery with a rich variety of species. 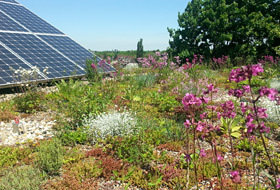 The spread per square metre of roof area is 40 g of sedum sprouts with 10 plug plants of specially chosen species such as rock thyme Acinos alpinus, Missouri evening primrose Oenothera macrocarpa, wall germander Teucrium chamaedrys and wild strawberry Fragaria vesca. There are 22 different types of plug plants in all. As is the case with all flat roofs, it is necessary to go onto the roof once or twice a year for servicing or maintenance purposes, requiring a fall arrest system. For this reason, the fall arrest system Fallnet® SR is already incorporated into the green roof build-up. It consists of grid elements with a fixed single anchor point at the centre and is held in place by the superimposed load of the substrate. In line with the same installation principle, the user-friendly rail system Fallnet® SR Rail, to which a person is attached, is installed around the existing solar thermal collector, avoiding the need to penetrate the roof waterproof membrane. This type of building shows that the correct selection of green roof system and construction specifications are vital for permanent greening success and the actual protection of the roof waterproofing. 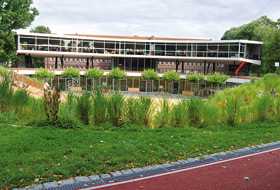 A particularly distinctive example from the school environment is the “Gorch-Fock“ primary school in Hamburg-Blankenese with its new extension that is home to eight class and group rooms and a recreation hall. It has a 400 m² roof area that forms part of a Tartan running track. 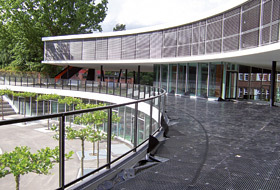 The topography of the school complex lends itself well to the type of design chosen by architects BRT Bothe, Richter, Teherani from Hamburg, whereby the Tartan track rises from the natural ground, continues over the canopy of the new modern extension and drops back down to the ground again. The ZinCo system build-up with Elastodrain® EL 202 was used for the installation of the running track on the roof. The garden and landscape contractors Wiese und Suhr from Hamburg began by installing the slip sheet TGF 20 over the root-resistant, bituminous waterproofing. 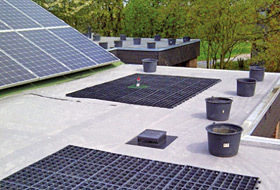 This was followed by a layer of highly-durable Elastodrain® EL 202 drainage and building protection boards made from fully vulcanised rubber, which are also used for impact absorption – covered with the system filter PV. Next came an approx. 25 cm deep base layer. Finally, the upper layer consists of PUR-bound grit as a foundation for the plastic coating of the Tartan running track. In addition to 280 m² of Tartan track surface there are a further 160 m² of paving stones on the canopy. As we can see with the Gorch-Fock school roof, many different solutions are possible on roofs provided the correct system technology is used. It is only possible to build economically and sustainably if permanently reliable systems are used. Provided a project is based on building-specific planning and professional execution, there are no limits to the ideas for green roofing and roof utilization. And, the children in schools, kindergartens and crèches will benefit even more from the roofs.